Using an online legal service like Rocket Lawyer is a reliable way to form an LLC, and it’s much less expensive than hiring a lawyer. 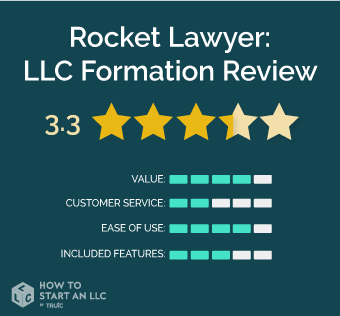 In this review, we’ll go over the details of Rocket Lawyer's LLC formation service and explain how it compares to other services on the market. Read on to find out if Rocket Lawyer is the right choice for you. Rocket Lawyer is different from other LLC formation services. Instead of individually charging to form your LLC, Rocket Lawyer uses a subscription-based model. The LLC formation service is actually bundled along with other legal services, including access to legal documents and legal advice. Researched and created by legal staff, their library of contract templates can save a lot of time for a new business owner. Plus, they'll even connect you with an attorney for help with customizing or enforcing them. All in one subscription. Who is Rocket Lawyer Right For? LLC formation service comes bundled with other valuable legal services. Get ongoing legal support for a fraction of the cost of a lawyer. Our recommended alternative to Rocket Lawyer is Northwest. They provide great value and customer service, you can read our full review here. Who should use Rocket Lawyer's Free Trial? The trial subscription is great for anyone new to writing contracts. You could spend hours browsing Rocket Lawyer's LLC-related templates alone. Each model comes with the full confidence in the staff of legal researchers behind it. You can even create documents for organizing personal matters like estate planning and bankruptcy. Note: Rocket Lawyer no longer offers their Accelerated Plan. Who should purchase Rocket Lawyer Premium? Rocket Lawyer recommends Premium for heads of households. They also recommend Premium for customers who are generally unsure of their legal requirements. With that in mind, we believe this package is sufficient for most businesses as well. We recommend this level if you expect to need legal advice but want to avoid costly retainers. To cover your bases for the whole year, go with the annual plan for 20% off the monthly rate. Rocket Lawyer excels at helping customers form their LLCs while saving money on legal fees. By behaving as a middleman, they’re able to help law firms control their costs associated with finding new clients. The cost benefits of this model are then passed on to the customer. The result is a valuable and affordable service for new business owners. It took several tries to get information that the website could have already explained. After a lengthy hold, we ended up routed to the sales department for an answer. The representative was polite and helpful but had a dual interest in closing a sale. Finally, the free trial model is prone to being a source of frustration for unwitting users. Downgrading or canceling your trial subscription requires calling a hotline. This makes us feel as though selling is at a higher priority than service. The user interface is very friendly. You can manage your LLC formation paperwork and other necessary legal documents at a glance. The platform even makes recommendations based on your type of business. The digital signature service makes creating enforceable contracts a breeze. Rocket Lawyer also guides you through each decision point for every form template. The most time we spent building a form was about 5 minutes. Although Rocket Lawyer can help file your LLC, it's designed more to help save on legal fees.